The revolutionary Space Bag Vacuum-Seal Storage System is perfect for all your storage needs! VAC: Use any household vacuum with hose to evacuate the air. Reduce volume up to 75%! I find these bags very valuable for saving space. I have 15 and I am ordering 15 more. We have two kids and want to save the clothes they outgrow in case we have more children. That is a lot of clothes! These bags have helped me store them in the limited space we have. I have not used the ones that I just ordered with the special value, but I did buy some from Walmart and I love them. Every household especial if you have kids should have many of these, it saves space and money and keeps your things safe and dry. I couldn't be more satisfied with Space Bags. However, it is important that you do not confuse the original product with all the knock-offs that you can find in "Family Dollar" type stores. The plastic is too thin and the seal that holds the so-called vacuum is totally useless. 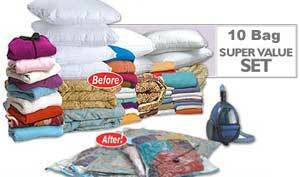 Space Bags is a FABULOUS product that saves you space, time and money!